His Royal Highness the Earl of Wessex attended by the Countess of Wessex were the guests of honour at the Royal Opening of the Marlowe Theatre on 4th October 2011. Prince Edward, who was Royal Patron of the fundraising committee, was at the theatre to mark the occasion and unveil a special plaque. The new theatre, described as a “third millennium building for a first millennium city” sits on the same site as its predecessor, on the banks of the river Stour. Mark Everett, the Marlowe’s Theatre Director said: “Audiences at the new Marlowe Theatre will have the opportunity to be entertained, to enjoy, to learn from and to talk about world class theatre. 1200 invited guests listened to the first public performance in the newly built £25.6m theatre, given by the Philharmonia, one of the country’s leading classical orchestras with a varied programme ranging from symphonic music to extracts from operatic works with stars including the celebrated bass singer Sir John Tomlinson putting the new theatre through its acoustic paces. 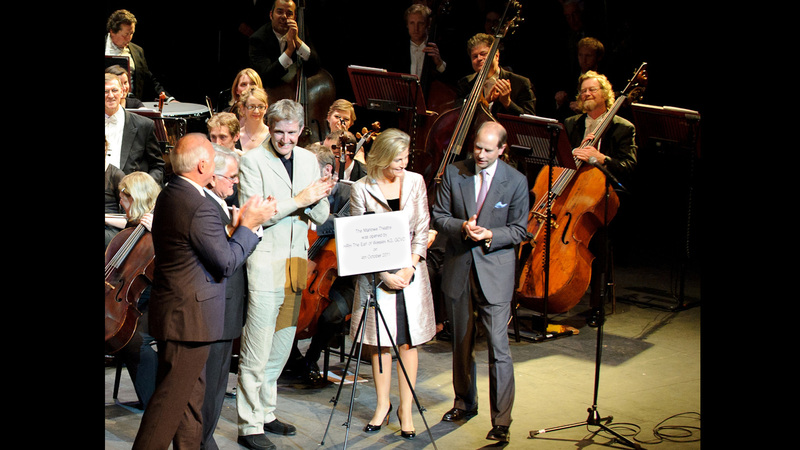 After the concert Keith Williams was invited on stage to join the royal party to take applause from the 1200 audience for the design and creation of the new building.